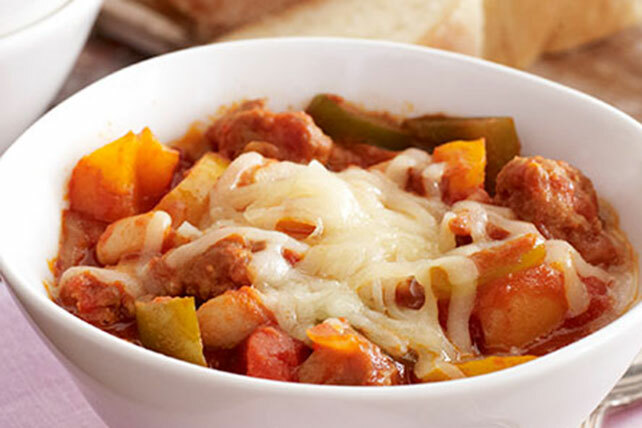 Try a Slow-Cooker Tuscan Chili that starts on the stovetop and finishes in the slow cooker! You'll love coming home to this Slow-Cooker Tuscan Chili. Crumble sausage into large skillet. Add onions; cook until sausage is browned, stirring frequently. Drain. Transfer to slow cooker. Stir in herbs; cover. Cook on HIGH 10 min. ; stir. Serve topped with cheese. Serve with a smart side of an avocado and onion salad to round out the meal. Prepare using turkey Italian sausage. Brown sausage with onions in large saucepan; drain. Add tomatoes, peppers and tomato paste; mix well. Stir in beans and herbs. Bring to boil; cover. Simmer on low heat 35 min., stirring occasionally. Serve topped with cheese. Prepare using KRAFT Shredded Italian* Low-Moisture Mozzarella-Parmesan Cheese Blend. Add 1/8 tsp. crushed red pepper to the cooked chili along with the herbs.